Every now and then, a game is released that is like no other before it. In one way or another, it's completely unique. 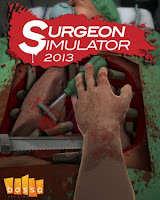 When I heard the title, "Surgeon Simulator 2013," it's fair to say that I was not expecting it to be one of those sorts of games. How wrong I was. Out of my many years of experience as a gamer, I can recall nothing even remotely similar to this. The title may put some people off, as it just sounds like one of those badly made simulator games that no real gamer would ever have any interest in playing, like Forklift Truck Simulator or something equally boring. Surgeon Simulator 2013 is less of a traditional sim, and it's probably one of the most unforgettable games I've ever played. Read on for the full verdict! As the game starts, you learn that you're controlling Nigel Burke, a surgeon. You start at his desk where you can do a number of things. You can answer the phone, scribble on a pad, play with some floppy disks or just make a huge mess. Always wanted to swipe everything off a desk? Now's your chance! You see, the thing about Surgeon Simulator 2013 is the very unique control system. You control each individual finger and the thumb on Nigel's left hand. Each finger is controlled by a button on the keyboard, so you just rest your hand on the relevant keys and press which finger you'd like to grab with. The mouse controls arm movement, with the left button lowering your arm and the right button allowing you to rotate your hand. It's such a simple, intuitive control system, everything is easy to remember and it just makes sense. It doesn't make the game any easier though. You are tasked with carrying out three different operations (heart, double kidney and brain transplants), across two different settings. The first is a hospital, the second is the ambulance which is much harder as it bounces over speed bumps, momentarily lifting all your tools into the air and sometimes through the back door. Watching a brand new heart fall into the road behind you is never a happy moment. There are also two bonus levels however; one in space (yes, that's correct, space) and the other one contains two very familiar characters from Team Fortress 2. In this level, you pretty much recreate the Meet the Medic video, and fix up a dying Heavy. The operating tools in this level are all weapons from TF2. It could possibly be the greatest crossover of all time. Is this the best videogame crossover ever? All the correct tools for carrying out each procedure are provided, and the patient has been prepped, so you can jump straight in to operating. Basically the game consists of you picking up various surgical instruments (scalpels, hammers, drills, lasers!?) and using them in a very haphazard manner, to break through bones, organs and cartilage and finally get to the organ that needs transplanting. This is why the game is so incredible. It takes a very important job that requires complete precision, yet makes it literally impossible to be precise. You aren't supposed to be good at this game, you're supposed to enjoy yourself and have a good laugh, which is exactly what you'll do. The best thing is, you create the comedy, it's not like there's a hilarious script or anything, the laughs come from trying to watch people pick up and manipulate items. I've never seen a non-gamer laugh as much at a game, than at Surgeon Simulator 2013. That surely says something about it. The graphics are very similar to Team Fortress 2, cartoony but also very impressive. Everything is really detailed and smooth, and it's hard to fault them. The sound design is equally awesome, with satisfying bone breaks and organ squelching, as well as an appropriate soundtrack, reminiscent of ER or Casualty. Brain transplants require nerves of steel and the precision of a... hatchet? 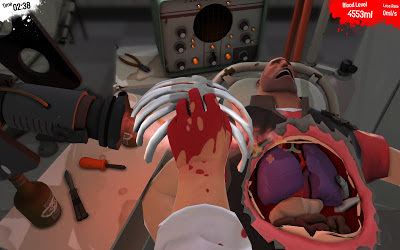 Surgeon Simulator 2013 really is a one-of-a-kind game, with it's unique controls and insanely hilarious gameplay. I defy anyone to play it or even watch a video of some gameplay, and not be in tears of pure unadulterated joy. Bossa Studios have created a perfect game that is both simple and maddeningly hard, and they have taken the absurdity to next levels with the space level and the Team Fortress 2 crossover. There aren't enough operations, that's the only flaw and even that does little to affect my opinion of the game. It has unlimited replayability. 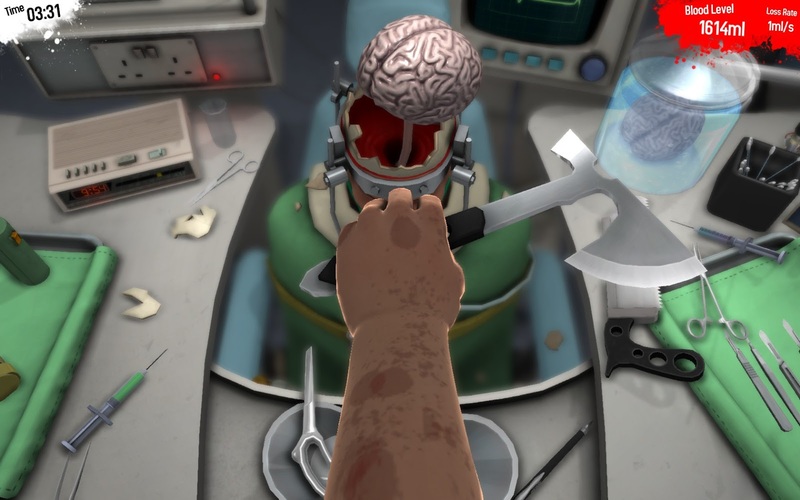 I can't think of a game in recent history that has made me as half as happy as Surgeon Simulator 2013 does. This is what gaming is about.